Amazon has entered the fray against Apple and Google with the launch of Fire TV, an internet-enabled set-top box that allows users to stream content onto their TV screens. At an event in the US yesterday, Amazon unveiled the small black box, similar in size to Apple TV’s device. It costs $99 (£60) in the US, but it is unclear what the UK price will be, or even when it will launch on this side of the Atlantic. The announcement follows hot on the heels of Google’s UK launch of its Chromecast dongle, which is the cheapest of the three options at £30 and can be attached to users’ TVs via the HDMI port, allowing them to stream content from providers such as BBC’s iPlayer Netflix and YouTube. The Chromecast undercuts Apple TV, which costs £99. 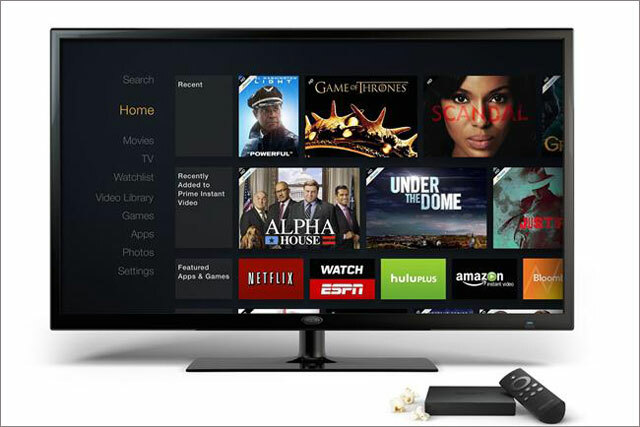 Amazon Fire TV gives US consumers access to content from partners including Netflix, ESPN, music-streaming service Pandora and Hulu, as well as gaming content from Sega, EA and Ubisoft. It also works with Amazon’s Prime movie-streaming service, known as Prime Instant in the UK and previously, Lovefilm. Jeff Bezos, Amazon’s founder and chief executive, said: "Tiny box, huge specs, tons of content, incredible price – people are going to love Fire TV. "Voice search that actually works means no more typing on an alphabet grid. Our exclusive new ASAP feature predicts the shows you’ll want to watch and gets them ready to stream instantly."